Fall Menu 2011 — Eat a Duck I Must! When Dan isn't teaching us something about photography, Jared is teaching Dan something about cooking... and I just eat. What happens when the stars align and the rare of occurrence of special visitors combined with moments of culinary inspiration come to transpire? Why, Jared's fall menu, of course! We were so excited to host our friends who were expecting their first child & our fave photographer (Dan of Chennergy.com) was in town and then on a separate evening one of our dearest blogger friends- Shirley (author of Kokken69) was visiting all the way from Singapore. I present to you, Jared's madness a.k.a. Fall Menu 2011 and a mish mash of photos from two separate meals. mix 1/2 cup of sugar and 1 cup of water until the sugar has dissolved. pour the solution into 2 martini glass and place it in the freezer. in a pot, slowly poach the lobster claw and knuckle meat in lobster stock until just tender or around 10 minutes on low heat. sprinkle togarashi and a splash of lemon juice on top of the lobster meat. After two or three tries last year, we finally succeeded in dining at Longman and Eagle. 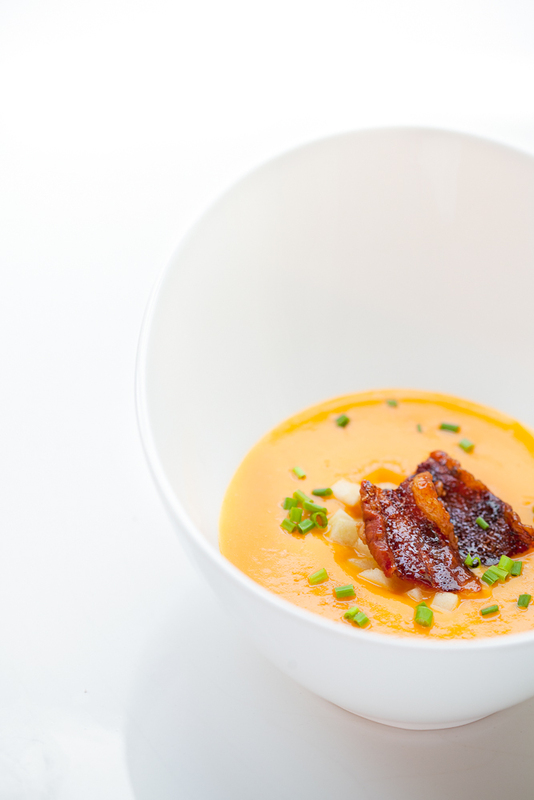 One of the most memorable dishes was a butternut squash soup with aerated maple syrup. While we couldn't figure out how to properly make an aerated maple syrup, Jared's version was not a bad remix! To finish, place a spoonful of the diced apple at the bottom of the bowl. Ladle the soup into the bowl and garnish with the chopped bacon and chives. As an option, you can also add julienned leeks, fried in hot oil. trim the asparagus and cut off the tender head. in a hot saute pan, add a tablespoon of oil then add the oyster mushroom, garlic and thyme. saute until the mushroom is nice and brown. remove the garlic and thyme from the pan and add the minced shallots. in a cast iron pan or a heavy bottom saute pan, heat the pan until very hot. once a nice crust has developed, flip it over and add 2 tablespoon of butter. tilt the pan a littler and splash the scallops with the hot butter oil. cook for another minute and remove it from the pan. 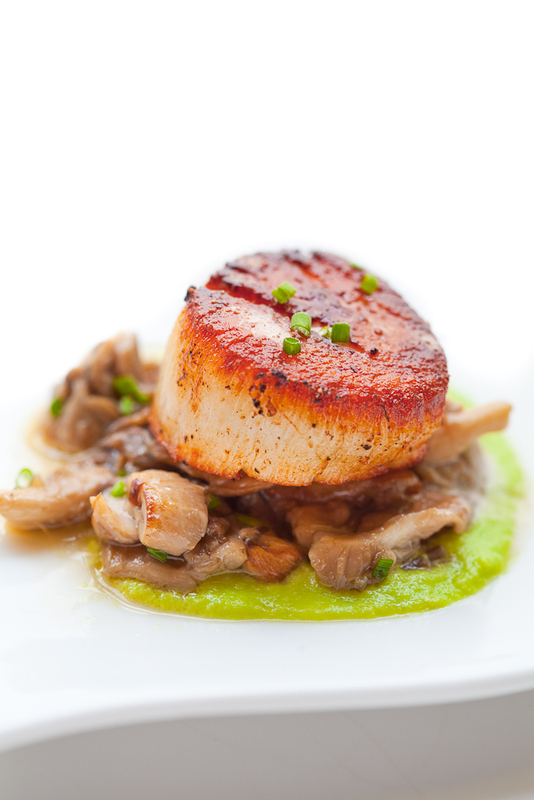 Optionally, you can substitute the asparagus with edamame puree, and use any mushroom that is available. This year, we had much success with our rooftop garden compared to last year and we were happy to use our own fresh cherry tomatoes. remove the fish out of the fridge 30 minutes prior to cooking. score the cherry tomatoes and blanch it in boiling water for a few seconds. sear the brussels sprouts face down in a hot pan saute pan. once the sprouts are caramelized, turn it over and add the minced shallots. deglaze the pan with the chicken stock or white wine and a little mirin. Cover the pan with a lid so the brussels sprout can steam until tender. in a hot pan, add a few tablespoons of oil. sear the fish skin side down until the skin is crispy. do not try to move the fish until the skin has crisped up, otherwise it will stick to the pan. El Ideas had just opened up and in concept it sounded much like our experience at Kahala in Osaka Japan. It was a 10 seater restaurant with specialized ever changing menus and guaranteed interaction with the chefs and the kitchen. One of the most memorable dishes was a poached chicken breast with bread and butter sauce. As we were eating this at El Ideas, I could immediately see the wheels turning in Jared's head, trying to figure out how to make this at home. He's made the bread and butter sauce a few times now, and I think it's pretty darn close! Use enough chicken stock to submerge the chicken breast, bring the stock up to 140F. Add a few pinch of salt to the stock. you want the stock a little salty to flavor the chicken. poach the chicken at 140 for 40 mins. alternatively, you can sous vide the chicken breast. Just vacuum seal the chicken breast with some of the stock. while the chicken is poaching, in another pot, add a ladle of the chicken stock from the poaching chicken and then add 1/4 cup of panko bread crumbs. using an immersion blender, blend the sauce until smooth. remove the pot from the heat and slowly add the chopped butter one at a time. swirl the sauce to melt the butter. To plate, place the roasted vegetables on a plate. place the poached chicken on top of the vegetable and spoon some of the sauce around the plate. Optional: you can add potato puree at the bottom of the plate. drizzle the potato puree with truffle oil and shaved truffles on top of the chicken. 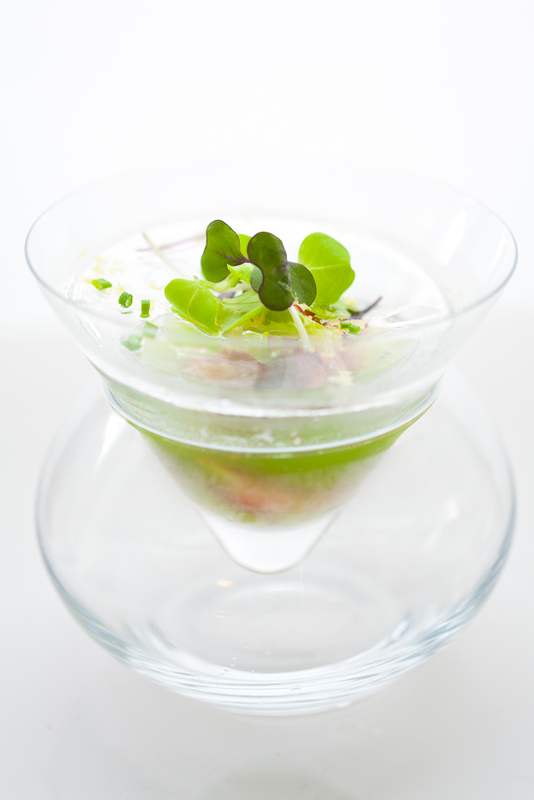 One could hardly forget the butter poached lobster we had at The French Laundry a few years ago. Lobster so succulent and a sauce so clean, the flavors have been engrained in our minds. Certainly this dish does not come close to Keller's dish, but it was certainly delicious ;) We also really wanted to make this dish for Shirley of (Kokken69). We knew lobster was expensive in Singapore and well, it was on sale at H Mart over here =P. carefully place the live lobster in the boiling water. Boil for 20-30 seconds. the shell should be red. To plate, spoon the rich sauce onto a deep bowl, place the lobster tail in the center and decorate with the raw shaved fennel bulb, fennel fronds and maitaki mushroom. Note: Leftover sauce can be made into a soup by adding heavy whipping cream. simmer for 2 hours. drain the stock through a sieve and cheese cloth. Pound the shell with a rolling pin to extract as much liquid as possible. to make the sauce, transfer 1 quart of the stock to a clean pot and slowly reduce the stock down to 1/2 cup. the sauce should be really concentrated. remove it from the heat and slowly add 5-6 tablespoon of butter, 1 oz piece at a time. whisk the butter until it has melted and full emulsified. Why Jared decided to do another recreation of Curtis Duffy's dish, I don't know. The man is crazy. The original recipe can be found here. Instead of sudachi, Jared used kyoho grapes since it was in season at the time of the dinner. You can use any liquid you like to make this dish. To make the thin shell, you really need to get the cocoa butter (not the stuff for your skin!!!) It took us a while, but we found it in the raw section at Whole Foods (it was not cheap!). To make the juice, Jared blended the grapes and passed it through a sieve to remove the clumps and skin. 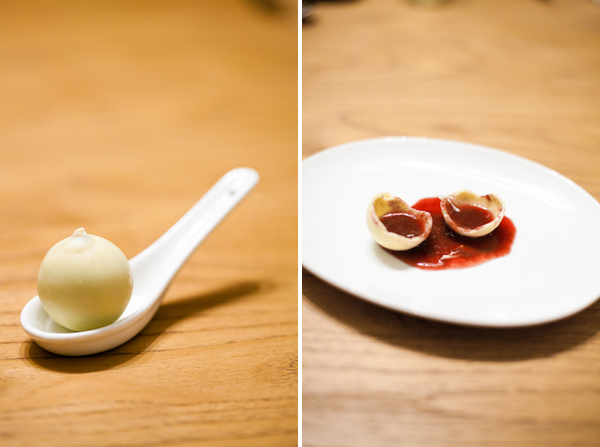 Then fill a spherical ice mold with the juice. His final inspiration for the multi-course meal came from staring at some leftover salted caramel in the fridge and Baby Duck's freeze dried apple snack. Jared decided to use it in making some form of a deconstructed caramel apple. Nothing says fall like Affy Tapple! !